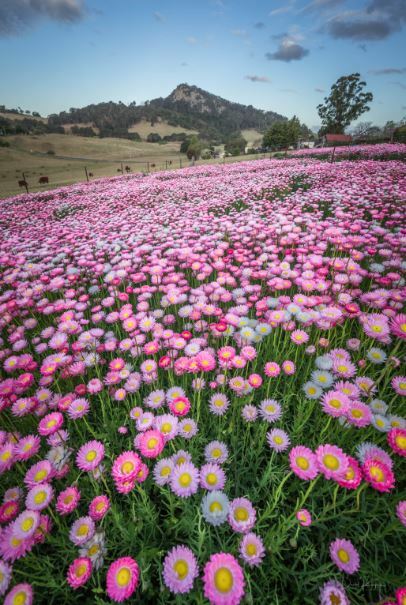 Mountain View Farm’s Everlasting Daisies. Photo: David Rogers. The rolling green hills of Tilba are known for many things. Settler history points to gold, timber, and dairy, even TV shows in recent times. Aboriginal history points to the healing power of this country especially the granite spires at the top of Gulaga, a place of deep spiritual significance to the Yuin People, a place for birthing and women’s business. 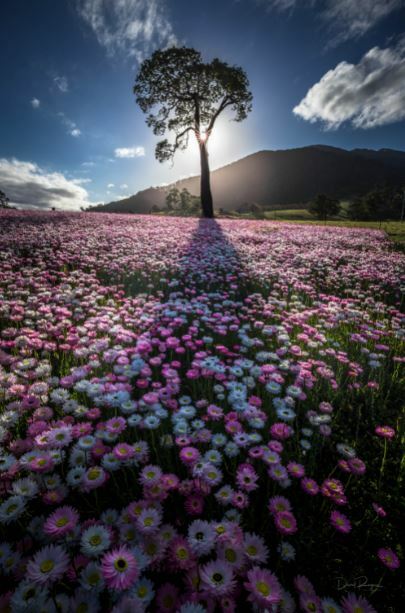 At the foot of this sacred space is a field of flowers more at home on the other side of this vast continent – a field of West Australian Everlasting Daisies. “A friend of mine in Western Australia grows them en masse; hectares of them and produces the seed stock,” says Kathryn Ratcliffe, Mountain View Farm. Kathryn Ratcliffe’s 1000 square metre paddock of pink, white, and yellow. Photo: David Rogers. 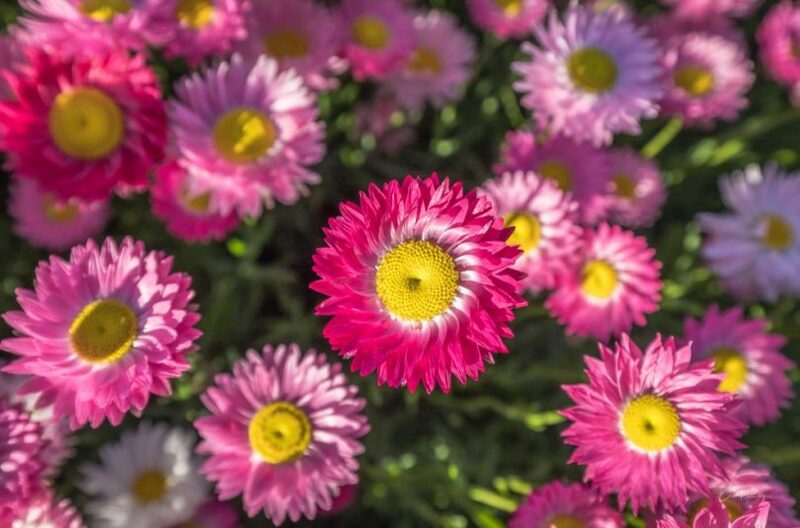 This is the second year the pink, white, and yellow of the daisies has sat alongside the walking track up Gulaga, just behind the old Pam’s Store on Corkhill Drive. Last year’s trial worked, “I was a bit blown away by how lovely they were,” year two has been more of a challenge. “It’s been so dry, I thought we were going to lose them, they were so tiny a month ago,” Kathryn says. When it comes to planting her 1000 square metre paddock, Kathryn says she did most of it by hand, scattering the delicate seeds on ground she prepared with the farm’s old tractor. Time on the end of a garden rake followed to knock the seeds under the soil. Being West Australian natives the daisies are pretty tough and sprout readily; in the wild, they generally spread by self-seeding. Gulaga looms large over Mountain View Farm. Photo: David Rogers. Fresh cut flowers from Kathryn’s farm have been a feature of markets at Moruya, Tilba, Bermagui, and Bega over the last couple of weeks. Photographers have also been keen to capture the spectacle either in its own right or as a backdrop for portrait work. “When you are out here picking and the bees are all around and you’ve got Gulaga in the background – it’s very therapeutic,” Kathryn says. Walkers up and down the ‘mother mountain’ are invited to buy a bunch from the bucket of water at the gate or call Kathryn to pick their own. “These flowers, which close in the cold or when it rains, always make people smile, it’s just nice,” she says. Wholesale flower markets further afield are part of Kathryn’s ambition, but so too is building her classy farm stay business that sits alongside the field of flowers. Both are helping to build a new life for Kathryn and her kids in the Eurobodalla. Kathryn’s life has taken her from home base in South Australia to a career in freight and logistics in Sydney and Melbourne before love took her to the outback of Western Australia. Tilba seemed a better fit, and with the combined resources of her late business partner, another single woman, the vision of Mountain View Farm started to grow. “I was really lucky in the last financial year to win a ‘Tourism Demand Driver Infrastructure Grant’ through the Commonwealth Government,” Kathryn says. “The grant is all about helping build tourism infrastructure in the region. Partly inspired by her late brother’s time in a wheelchair, access for all is part of Kathryn’s mantra. “My plan has been to make it beautiful, lovely, and comfortable for everyone,” she says. Pets, kids, and large groups are also welcome at Mountain View Farm, the day I visited Kathryn was hosting a big family reunion in the renovated cattle yards. “The next big thing for the farm are safari glamping tents for summer,” she says. “This was the first dairy, the first selection in the Tilba region by the Bate family – Henry Jefferson Bate is actually buried over there under that tree. The flowers that started the conversation between Kathryn and I will last another four weeks at least before going to seed. Kathryn’s mum will harvest and store those seeds for next year, the ones she misses will sprout under their own steam late next autumn in the paddock that created them. The story of the old Bate farm rolls on, nurtured by the spirit of the mountain it sits under, a place of women’s business. Thank you to David Rogers for his beautiful photos. Wow Kathryn. What a beautiful inspiration you are to many. Keep up your wonderful work. Beautiful. Book me in already!! What a fabulous story. Mind you, we are talking about my very own niece! I am very proud of the courage in adversity and down right hard work that Kathryn has shown in taking on this entrepreneurial challenge on her own as a single mum with two children. Her mum, my dear sister Linda, has been a big support too especially in caring for the garden. Kathryn's two children, Stella and Marcus, have loved being involved and enjoy welcoming and interacting with visitors. Kathryn deserves success and accolades for her achievement. If you visit Mountain View Farm you are in for a delightful experience!! Yes, a lovely story! What a pioneer! Lovely to acknowledge the help Kathryn has had from family and others. 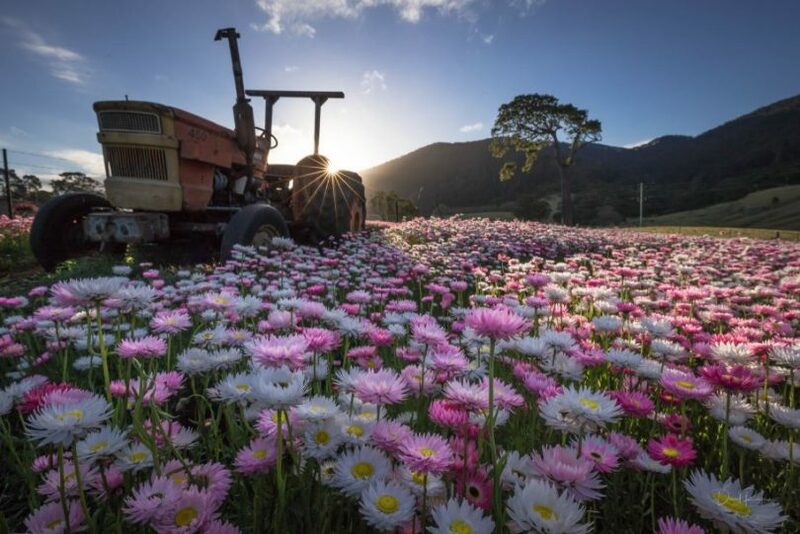 How nice that Western Australian daisies have transplanted so easily to their new environment. Amazing that no one else has done anything like this before.